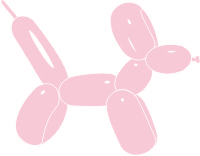 Bag of 50 x Sempertex Balloons in colour: Bubble Gum Pink (code: 009) – balloons come in 50 count bags. SKU: code 009 (61). Category: 260 Fashion Solid. Tags: bubble gum pink 260's, modelling balloons, pink 160's, sempertex 260's, sempertex balloons, wholesale. Share the post "Bubble Gum Pink 260 Sempertex Modelling Balloons"